Using dry fruits and nuts has been is practice for long such as cashew , hazelnuts , pistachio,almonds and walnuts . Bakery manufacturers have now started adding concentrated fruits bits for consumers who demands for healthy recipe . 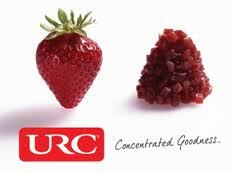 Taura Natural Ingredients has developed fruit range using URC process technology . This New Zealand based company is a leading global manufacturer and supplier of functional, concentrated fruit ingredients for leading brand marketers and product manufacturers. Taura Natural Ingredients has developed the ultra rapid concentration (URC) High Performance Fruit range as a way to include real fruit pieces in commercial biscuits and bakery applications. Manufactured with its URC process technology, the fruit pieces are developed as functional ingredients with bake stability and moisture control. "We're seeing real growth across Asia in the use of fruit in sweet biscuits to achieve a healthier proposition," says Julian Laking, sales manager in New Zealand and Asia. "With URC pieces, a real sense of fruity freshness is achieved, which is difficult to create from traditional dried or artificially flavored products."